Marked as Home Interiors. It is approximately 8 x 5 inches. There are no chips, cracks or breaks, but has a couple of manufacturing flaws. Other pieces from the original set are available. I need your zip code to calculate the postage. 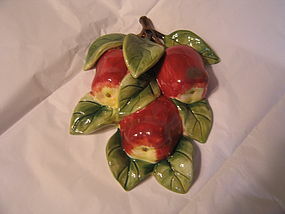 Ceramic apples made to hang on the wall. They are marked as Home Interior. The measurements are 8 x 6 1/4 inches. One leaf has a small flake of paint missing at the tip. Other pieces of the original set are available for purchase. I need your zip code to calculate the postage. 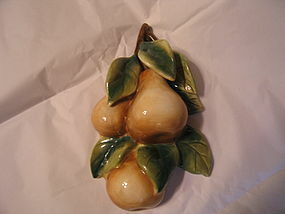 These ceramic grapes are part of a Home Interiors collection of wall hanging fruits. Home Interiors is no longer in business. There is a paint flake on one leaf that is mainly on the back. I am selling this piece as a replacement, however, I do have the other pieces available for purchase. 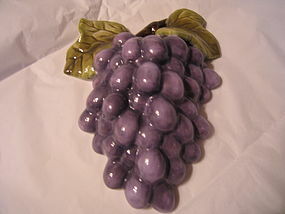 The grapes measure 7 1/2 x 5 3/4 inches. There is no damage. I need your zip code to calculate the postage. 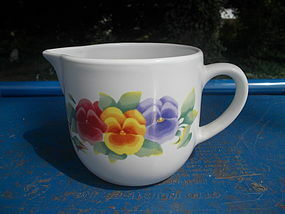 1992 FTD Especially for You vase. The flowers on the front and back are pastel pink, blue and yellow. It measures 7 x 5 inches. There are no chips, cracks, breaks or rough rim. One pinpoint size dark dot on one side that is from the manufacturer. I need your zip code to calculate the postage. 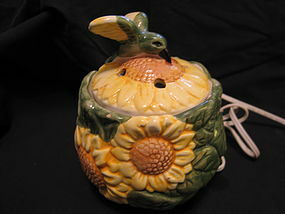 Electric potpourri or incense burner manufactured by Leader. It is marked as an air freshener. I am not sure of the age, but was manufactured in Taiwan. The cord has a control switch. It is in working order. There are a few small paint flakes to the ceramic. I need your zip code to calculate the postage. 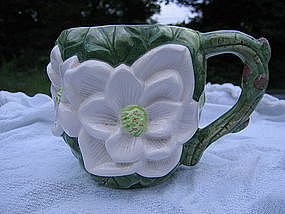 This is not a new water lily mug, but not old enough to be vintage. It was manufactured by World Bazaar. It holds 15 ounces. There is no damage. I need your zip code to calculate the postage. 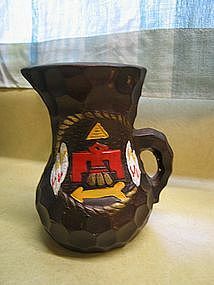 I really don't know much about this ceramic pitcher. It belongs to my daughter, and she doesn't know anything about it, except she thought it was cool. It is 4 1/2 inches in height. There is minor paint loss to the finish. I need your zip code to calculate the postage. 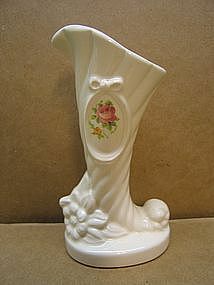 When I bought this vase, I thought it was a boot shape. There is no manufacturing information. The measurements are 6 x 3 1/4 x 2 1/4 inches. There is no damage. I need your zip code to calculate the postage. 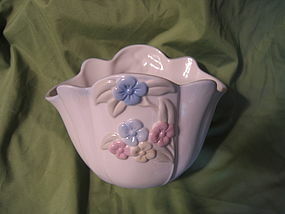 Vintage unmarked planter measuring 4 1/4 inches in height and 5 1/2 inches across the top. The drip plate is attached. There is minor roughness around the top rim, but does not appear to be damage, but rather the way it was manufactured. I need your zip code to calculate the postage. 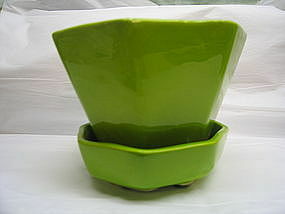 This 2 piece set was made from an Arnels mold and dated 1974. There are no chips, cracks, breaks or rough rim. I need your zip code to calculate the postage. 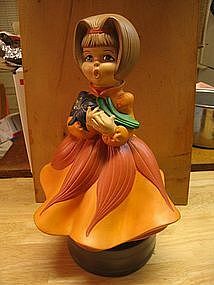 This ceramic figure is marked as "Margie" 1976. I do not know the manufacturer of the mold. It measures 12 inches in height. There is some minor loss to the finish, mainly around the hem of the skirt. The music box works, although sometimes it is a bit slow to start. Additional photos by email. I need your zip code to calculate the postage. 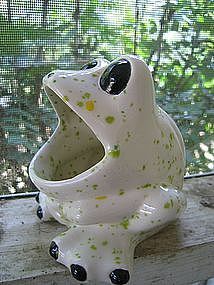 Vintage ceramic soap or anything holder measuring 4 1/2 x 4 1/2 x 4 1/2 inches. There are no chips, cracks, breaks or rough rim. I need your zip code to calculate the postage. 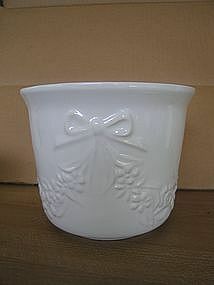 Vintage planter marked as Made in EC, which I understand was manufactured in the European Union. 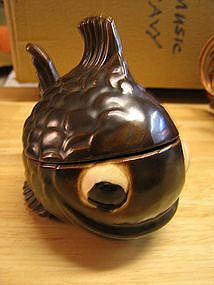 I am not sure of the manufacturer, but there is a rooster backstamp molded in the ceramic, which should help with identification. It is 3 1/2 inches in height and 4 inches across the top. There are no chips, cracks, breaks or rough rim. It is available in a larger size. Photo of backstamp available by email. I need your zip code to calculate the postage. From my understanding, made in EC, could mean any number of European Countries, however, the a rooster emblem molded in the bottom of the planter, which could help identify the manufacturer. 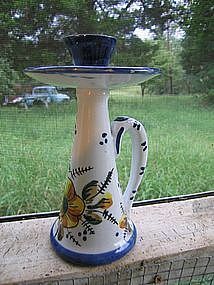 It is 4 1/2 inches in height and measures 6 inches across the top. There are 2 paint flakes on the rim. Backstamp photo by email. 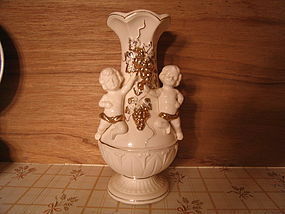 I have a smaller size of this planter available. I need your zip code to calculate the postage. The bottom is faintly incised with what appears to be Gadiaz (I assume that it is Cadiaz) Spain. It is almost 8 inches in height. There is a paint flake on the rim. There is what appears to be an interior glaze crack on the rim - I say glaze crack, because it does not extend to the exterior. I need your zip code to calculate the postage. 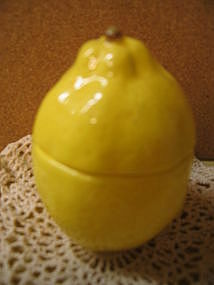 Vintage lemon shaped sugar bowl manufactured by Knobler in Japan. There is a small interior rim chip. The matching lemon shaped tray is also available for purchase. I need your zip code to calculate the postage.